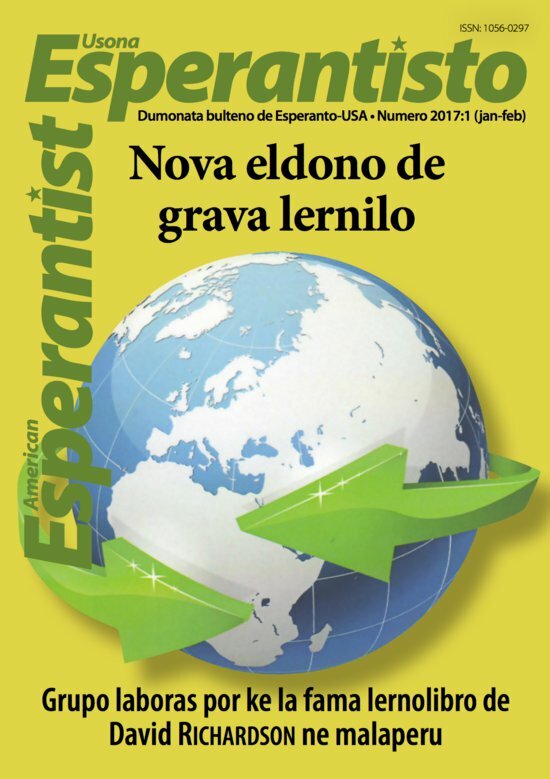 Usona Esperantisto № 2017:1 en formo de presebla PDF-dosiero. This year the Annual Congress and NASK are scheduled at the same location, one right after the other. I encourage you sign up for both of them. Noteworthy mentions of Esperanto in American media. Poemo verkita en 1931 de Oleksandr Oles, elukrainigita en 2017 de Petro Palivoda. Arlyn korektas erareton en Bridge of Words. Since its appearance in 1988, Esperanto-USA has published and sold the book Esperanto: Learning and Using the International Language by David Richardson. When it became clear that the existing stock was nearly gone, a group of members took action to update and reprint it. Ŝiboleto grimpis en la malordan jaĥton de Malliven. En la eta kajuto li trovis la kadavron de Robeĉjo. Ĝi kuŝis surdorse.